A “mere” 800 metre swim followed by a “wee” 10km run is all that stands in the way of Graeme Lundberg completing a challenge which if described as superhuman wouldn’t be too much of an overstatement. 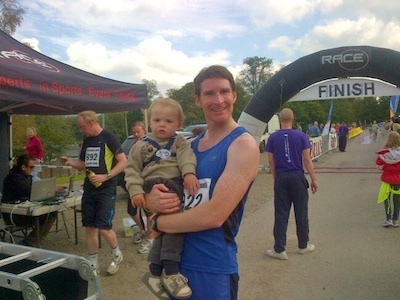 When the 33 year oldformer Dundee United youth team player crosses the finishing line at the Stirling Aquathon on Sunday, he will have completed 22 grueling events in seven months. And the fact that he uses those two words in quotation marks above to describe his final effort, gives you an insight into how tough some of the other 21 have been. After reading in the Dundee Courier about little Oliver Gill’s tragic five and a half month battle against a very rare and aggressive form of cancer, Graeme decided to, as he put it, “change a few things and get the finger out” and raise some money for the Love Oliver Charity Trust Fund which was set up in memory of baby Oliver by his parents Andy and Jennifer. The charity, which has raised over £118,000 helps fund research into childhood cancer and provide support to families affected by it. Graeme explains that the relatively new experience of becoming a father himself played a major part in motivating him to help. “My young lad, Joseph, was about 9 months old at the time and the year before, I probably would have just skirted through the paper on my way to the sports section or Television pages, but once I started reading the piece about Oliver it was hard to fathom the bravery of his parents, two of the bravest people I know. There were certain pictures of Oliver that reminded me of my own son and I just wanted to do something to raise awareness and also some cash for this charity which captured my heart”. If you take a look at the Facebook and Twitter accounts he set up to document his fundraising journey, then you’ll notice they’re both called 5MarathonsGL. So while his heartfelt connection to Oliver’s story might go some way to explaining setting himself an arduous five marathon challenge, how does he explain finding himself “doing a 1900m doggie paddle” in the freezing cold water of Loch Tay as part of the Aberfeldy Half Ironman? “That wasn’t on the cards!” he admits. “Initially, I thought the maximum I could do was maybe five marathons – all the Scottish ones, which was still a lot as the most I had run previously was a 10k, and to be honest my knees were in all sorts of trouble after that. There was no way I would’ve even thought about doing a half marathon and then one week after reading about Oliver, I’m thinking about doing 5 full ones, and then it just escalated from there into finding out what other events I could get involved in”. A quick look at some of the locations these extreme tests of body and mind have taken place in and you could be forgiven for thinking he’s had a lovely time taking in some of the finest scenery our country has to offer. Fife beaches, National Parks, beautiful coastlines, lochs, mountains, the capital city, and stunning, scenic Highland roads have all featured in Graeme’s varied itinerary. He admits Scotland’s beauty has been somewhat wasted on him, “It’s true, there have been some great scenic courses, but most of the time I’m focused about 30 yards in front of me and that’s it, just trying to drive on and keep running”. It’s not surprising that the undulating terrain and inclement weather of this beautiful country throws up some interesting challenges for the novice marathon runner. “Each marathon is it’s own wee beastie.” He continues, “For example, The Edinburgh Marathon was really tough. It was about 27 degrees so that was a fair shift and the one after that was Strathearn where the route was based around the hilly Comrie/Crieff area. There was hardly a flat bit on the whole course with a huge climb to something like 1500 feet above sea level – almost at altitude!”, he jokes. So far Graeme has raised over £4000 but it’s not all been down to putting his body through the pain barrier. He also organised a 5-a-side tournament which took place on Broughty Ferry beach, a golf day at Drumoig and a Dundee derby charity football match which included ex players Lee Wilkie, Ray McKinnon, Grant Johnston, Davie Hannah, Bobby Mann, Andy Dow and former United under 16 teammates, Richard Thomson, Chris Devine and Steven Fallon. He couldn’t resist pulling the boots on again himself, playing the last 15 minutes along with Oliver’s Dad, Andy. Andy’s wife, Jennifer, is in awe of the lengths Graeme has gone to to raise money for the charity she and her husband set up in Oliver’s memory almost two years ago. She said, “We’ve had a lot of support and people have done amazing things to raise money and awareness, but we’ve never had anyone do anything like this. When we heard Graeme was thinking about running five marathons, we thought that seemed a lot, but 22 events is incredible!”. 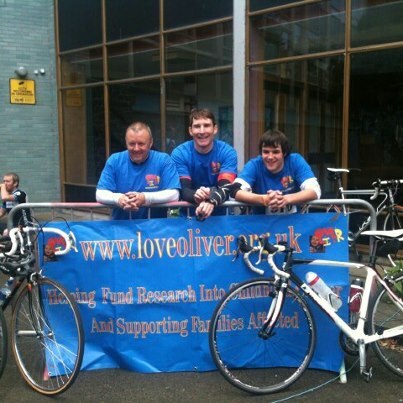 Jennifer acknowledges that Graeme has inspired a good number of people to get involved and has certainly spread the word about Love Oliver while he’s swam, cycled, and run all over Scotland. Jennifer adds, “I’m delighted he’s agreed to become an ambassador for Love Oliver as there’s no one better suited than Graeme. He’s so modest and his wife has also been so supportive”. On that note, it’s fair to say Graeme won’t be the only person happy to see the finish line on Sunday. 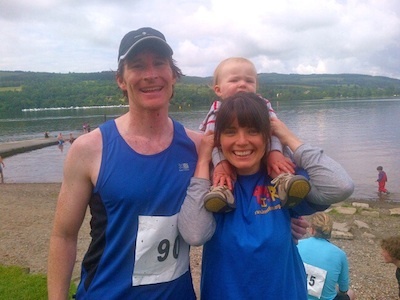 His wife Katriona, and son Joseph, have accompanied him at almost every event and while they’ve often made the most of their weekends away at events together, he realises it’s probably time to have one that doesn’t involve them waiting for him to finish a race. But is this the end? It’s hard to believe him when he says he’s finished. In fact he eventually admits to “pencilling in a few more, 10k’s and such like, and I’ll keep myself ticking over but I’m not sure I’ll do another marathon any time soon.” He pauses for about three seconds before saying, “You know what, I probably will!”. Below is the full list of events Graeme has completed. Also visit the Love Oliver homepage to find out more about what the charity is doing to help in the fight against childhood cancer.